Bright, Colorful Room: Love this Look? I’ve been staring at this bright room on Pinterest for a few days now. After Nemo snowed us in for the beginning of the weekend, it’s been refreshing to see the bright, preppy fun of this room. 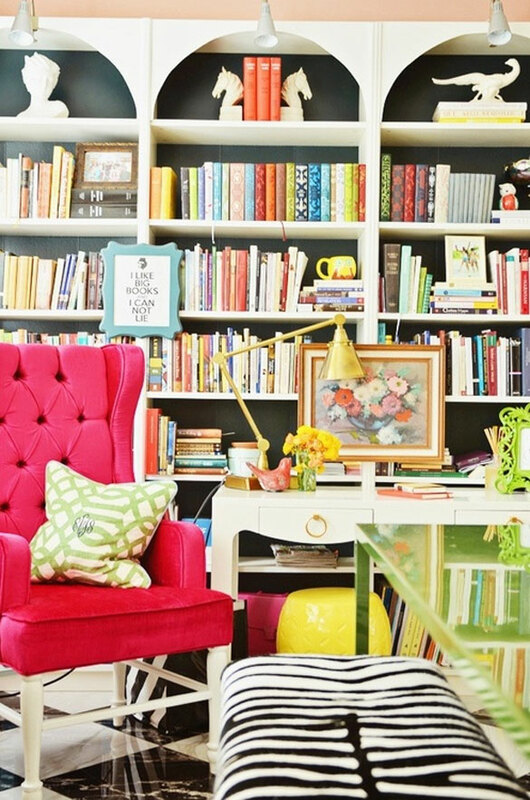 Of course, the bright pink tufted chair is what calls out to me the most. But I also feel that if I had such a vivid and colorful room in my home – such as a workspace – filled with all of those books and quirky accessories – I’d feel more motivated. Not that I don’t feel motivated now, it’s just that my workspace is in the basement, and I don’t always feel the urge to shut myself down there! Maybe if I had that hot pink chair I would! What do you think of this decor? Do you love this look or is it too colorful and maybe a bit too preppy for your style? Personally, I love it – and would love to see the rest of the space – but I can’t find the original source for the image! Such is life on Pinterest, I guess.